Shadowman needs little introduction to melodic rock fans, particularly those from Britain. The core of Shadowman is the exceptional vocalist Steve Overland (FM, The Ladder, Overland) and premier guitarist and song writer Steve Morris (Heartland). If memory serves me, 'Ghost In The Mirror' would be their third outing. Again, this is a solid offering of melodic guitar-oriented rock. On 'Ghost In The Mirror' you can expect basic compositions that straddle the line between melodic hard rock and AOR. To say 'basic' is not a bad thing; the arrangements are not formulaic, but rather derivative in the best sense. What Overland and Morris do, they do very well. So there's nothing novel or dangerously innovative here. From the open licks of 'Road To Nowhere' to the closing strains of 'Little Miss Midnight,' you know what you're getting and you're blissfully happy. 'Ghost In The Mirror' also benefits from some old school keyboard stylings from Steve Millington (10CC) as on 'Road To Nowhere' and 'Keeper Of My Heart.' For my money, the better than standards songs are the above particularly 'Keeper Of My Heart' where both Overland and Morris exceed individual expectations, and also 'Outlaws,' a better rocker with a steady pace, strong fret work and horns! Conversely, the dilemma with Shadowman's 'Ghost In the Mirror' is that the tried and true can easily become the old and mundane. Frankly, Steve Overland sounds tired. And maybe Morris should have stirred up his compositions a little more with something novel. Still, it all sounds so good: pleasingly simple and satisfying. 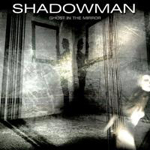 Shadowman's 'Ghost In The Mirror' is classic and consistent melodic rock straddling AOR delivered by two masters, Steve Overland and Steve Morris. It's pleasingly simple and satisfying yet flirting dangerously with 'heard that before' mediocrity.